The keyless option for door locks is very convenient in many ways and has become very popular for many door applications. Eliminating the need to carry any keys around makes keyless locks hassle free and its many other benefits may make it the right choice for your door as well. This Kaba Access Control E2031XSLL is a high quality E-Plex electronic pushbutton lock with key override. It is designed for doors within the range of 1-5/8" to 2" thick with a 2-3/4" backset. This Kaba Access Control Simplex 5021BWL is a mechanical pushbutton lock with IC core key override prep. It is a highly weather resistant lock that provides exterior access by combination, while allowing free egress. For high-traffic commercial, institutional, and government buildings. This Kaba Access Control Simplex 5021XSWL is a mechanical pushbutton lock that retrofits cylindrical and tubular locksets with a 2-3/4" backset. It operates with a vandal resistant keypad with solid metal pushbuttons. This Kaba Access Control 1011 Simplex series mechanical pushbutton knob lock is a convenient, heavy duty product perfect for access control between public and private areas. The bolt is retracted when the correct 5 digit combination code is applied. This Kaba Access Control 1021 is a Simplex series mechanical pushbutton knob lock with key override. It will retrofit cylindrical and tubular locksets with a 2-3/4" backset. This lock is pre-assembled in the factory as left-handed, but it is easily field reversible. This Kaba Access Control L1011 is a weather resistant mechanical pushbutton lever lock. This Kaba Access Control L1031-26D is a Simplex mechanical pushbutton lever lock. It is supplied with the passage mode which, when set, allows free entry without using the combination code but by activating it with a key on the outside or thumbturn on the inside. This Kaba Access Control L1021 Simplex mechanical pushbutton lever lock includes the key override feature using a small format interchangeable core (Best type) or a large format removable core. It will retrofit cylindrical and tubular locksets with a 2-3/4" backset. The combination can be changed in seconds without removing the lock from the door. This Kaba Access Control 74366-000-01 Simplex combination chamber is a replacement used with L1000/1000/8100/3000 series pushbutton locks. This Kaba Access Control 8148B-26D is a pushbutton mortise lock with key override, passage and lockout features. This lock operates with one access code for all users. It can be easily programmed via keypad without removing the lock from the door. The Kaba Access EE100/EE1000 mechanical pushbutton lock controls both entry and egress with a single combination. The Simplex 3000 mechanical push button lock provides exterior access by combination for narrow stile aluminum glass doors. This Alarm Lock DL2700 Trilogy 2 is an electronic digital, heavy duty lock designed for interior use. It can hold up to 100, 3 to 5 digit codes, 1 master, 10 managers, 90 basic users and 3 one time service codes. This lock is powered by 5 AA alkaline batteries which are included in this package. This Alarm Lock DL2700WP Trilogy T2 is an electronic digital lock that is weatherproof. This lock is designed to endure temperatures as low as -31 degrees Fahrenheit (-35 degrees Celcius)and as high as 151 degrees Fahrenheit (66 degrees Celcius) in interior and exterior applications. This Alarm Lock DL2700IC Trilogy T2 electronic digital lock is prepped for IC core. The standard model accepts Best type small format interchangeable core for six and seven pin cylinders. The core is not included in this package. This Alarm Lock DL3000 electronic digital Trilogy T3 lock includes a very useful audit trail feature. This function will record up to 1,600 events in a log. Each time the lock is activated the day, date, time and user of the lock is recorded for later reference. This Alarm Lock 103-12V compact electric deadbolt is powered by a continuous duty solenoid. It is excellent for narrow stile doors and it is very simple to install. The door is locked or unlocked by remote switch, key switch, time programmer or other electrical contact which interrupts the power. This Alarm Lock 103-24V is a compact electric deadbolt which is a standard fail safe unit that will project the bolt only while the power is on. This deadbolt is simple to install on all door types and it is operated by a remote switch, key switch, time programmer or other electrical contact which will interrupt the power. 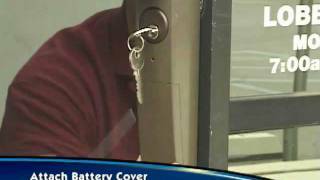 The alarm Lock 104RA 24 volt AC/DC fail secure Lektrolok is a compact electric deadbolt simple to install on all types of doors. The door is locked or unlocked by remote switch, key switch, time programmer or other electrical contact which interrupts the power. The Schlage CO100-CY-70 is an offline electronic pushbutton lock with 500 use codes that can be easily added or deleted at anytime, right at the door. User rights for the CO-100 are stored on the lock. The CO-Series from Schlage makes it easy to upgrade from traditional mechanical solutions to electronic access control. Electronic access control provides added security, convenience and efficiency. Weather resistant. The Schlage NDE80 is a wireless lock with ENGAGE technology. 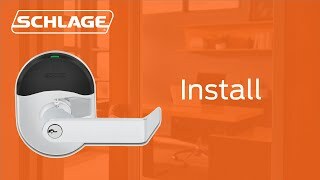 The new Schlage(R) NDE Series wireless locks with ENGAGE technology are designed to be easy to install, manage and use. ENGAGE technology cloud-based wireless offline security solutions simplify the ability to connect people, openings and access management. NDE Series wireless locks simplify installation by combining the lock, credential reader, door position sensor and request-to-exit switch all in one unit. XCeedID cards are completely compatible with HID Proximity readers and ideal for use with Schlage NDE locks. These cards easily fit in a wallet or may be used as a strapped or clipped ID badge. Fed up with dealing with multiple keys, misplacing, replacing and misplacing again? Tired of keeping track of your keys and forgetting them at the most inopportune of times? Have enough to worry about without the being concerned that your key got into the wrong hands? Well, we have the perfect solution which will not only eliminate the hassle and headache of keys, but will provide for a safe and worry-free alternative. Keyless door locks will not only replace your existing key locks with a more convenient option, they will also serve as an upgrade in the security and peace of mind your lock offers. Keyless door locks will not only eliminate the need for keys and all that comes along with that, but there are many more benefits to these locks. Firstly, the convenience afforded by keyless locks is unique to these locks and cannot be matched with any other option. With the installation of one of our keyless options, you can simply punch in a pass code and enter. Forget the keys and the bother they created, and erase the memories of all the unpleasant situations they have put you through. They are also a much safer and more secure solution for many applications since they are harder to pick, you don’t need to hide a spare key anymore and risk having it found, and the pass code can always be changed if your worried it got into the wrong hands. A lock with a pass code is also an excellent option for a business where many employees need access to the door. No more worrying about whose hands yours keys will reach. You can now control who knows the pin and with an electronic device you can even keep track of the coming and going of your workers. Many locks also offer the option of multiple passcodes, where you can control who has access when. Keyless locks are also very popular in the main entrance to apartment buildings. Since all the residents need easy and constant access, this is the perfect solution. Avoid having to keep track of all your keys and simply let your tenants know the pin number. Rest assured that your tenants will be more than happy with the change. Combination locks can also be used on the entrance to your home. Stop worrying about your kids losing their keys or getting locked out. They will now have easy access at all times with a simple pin number to remember. They’ll know they’re safe, and you’ll know they’re safe, what can be better? Qualified Hardware is pleased to be able to help you make this transfer from keyed to keyless as simple as possible. We carry a large variety of keyless door locks, both mechanical and electronic, to service the needs of many different applications. Browse through our extensive selection to find the keyless option that is most suitable for your needs.